There is nothing like the magic of Disney. I should know, I’ve been to Disneyland Paris 5 times since the age of 18 and I’ve loved it every time. There’s something quite magical about it that lets you melt into the atmosphere of the beautiful lights, the castle and the joy that surrounds you, not to mention the odd scream coming from whoever is being shot out of Space Mountain! I’m a sucker for presentation and Disneyland Paris is always impeccably decorated according to the time of year. No expense is spared; in Autumn the streets and Central Plaza you will find pumpkins galore and in the Winter you will be surrounded by snowmen and Main Street will occasionally start to snow. There is no detail left undone making it hard to fault by adult standards, let alone children. Disneyland Paris is split into 2 parks (Disneyland Park & Walt Disney Studios) plus the Disney Village for shopping and eating. The Disney Park itself is split into 4 ‘lands’- Frontierland, Adventureland, Fantasyland and Discoveryland, each with its own self explanatory theme. My personal favourite is Fantasyland as to me that’s the most ‘Disney’- my favourite part is of course the Castle with the story of Sleeping Beauty told by window panes inside the castle with a robotic Dragon Malificent in the caves underneath. My favourite ride? It has to be Thunder Mountain – thankfully not quite as scary as Space Mountain, you’ll find it in Frontierland. Of course for the man in my life I had to go on Space Mountain (Discoveryland) more than once – scary biscuits but certainly a lot of fun. Walt Disney Studios is definitely more adult friendly. With the addition of Crush’s Wild Ride, The Tower of Terror and Ratatouille in particular in the last couple of years, the park has really upped its game in terms of cutting edge technology. Ratatouille is hard to explain but it’s essentially a moving 3D experience of the film where you sit in a moving car that takes you to different areas of the restaurant as if you were a mouse. Ducking and diving under tables and cookers your glasses make you feel as if the experience is real, and in a way it is as you will feel the heat of the cooker and the rapid movement of the kitchen around you. Definitely give the Aerosmith Roller Coaster a go – it’s truly awesome. I have never visited Disneyland accompanied by children but as an adult 2 full days is enough time to visit both Disneyland Park and Walt Disney Studios. Get up early, never underestimate the power of a comfy pair of shoes and get to the park at opening time (10am) or soon after. It will take about 5-6 hours to do the Disney Park depending on whether you want to go on all the rides or not (some are for very small children) which will give you enough time for a parade or 2, lunch and some shopping. Please note I always visit during ‘off season’ so queues are a lot shorter, if you visit during the Summer you will find you need a lot longer. Disney Studios is significantly smaller and can be completed in about 3-4 hours, giving you time to go back and do rides a second or third time in either park (if you have a Hopper Pass). As a seasoned veteran I have put together a list of 15 tips to help make your visit easier and hopefully cheaper too! Make sure you pick up a map and a guide on your way in. Not only will it show you all the rides (and where the toilets are! ), but it will tell you what time the parades and light show is on at. If you want to meet the characters check where they are and when using the park guide. Disney is pretty strict with times so if you turn up at 10.20 for an appearance that’s closing at 10.30 and there’s a queue, you haven’t a hope. Mickey can be found for most of the day however at the rear of Fantasyland in his own showroom where you can have your photo taken with him both professionally and with your own phone / camera. Use FastPass- at busier times this makes your trip so much better. Simply go up to the Fastpass area of the ride (not all rides have them, only the major ones – check your map) and scan your entrance ticket. You will be provided with a return time slot (30 minutes) and you can go back to a separate, quicker queue. Check the school year timetable- France school holidays differ to the UK’s and you could find yourself there during a school break which will mean a very busy Disney! If you can, go off season. I always go October – February time and this means the parks are quieter meaning less queues and cheaper accommodation & flights. Check the ticket prices – off season means you can get ‘mini hopper tickets’ again this is down to school and national holidays. There can be up to a £10/€14 difference in price per ticket per day. Stay in affiliate hotels. Once inside Disneyland Paris you have the official Disney Park Hotels including the luxurious Disneyland Hotel but there are also affiliate hotels on site which can be much cheaper to stay at including The Dream Castle Hotel and Magic Circus Hotel both of which I’ve stayed at and enjoyed. Don’t always book a package. Sometimes (most of the time) booking your tickets, hotel and flights separately is a lot cheaper. Try Attraction Tickets Direct for your tickets – I have always found them quick on delivery and reasonably priced. Bring a backpack of supplies. There’s nothing stopping you bringing a packed lunch if you want but also it means you can carry something to layer up when it gets colder at night. Bring a water bottle, there are fountains all over the park and you can expect to pay around €3.75 for a bottle of Coke. Watch the parades. They’re really very good and usually there are 2 types throughout the day- a themed one (at the moment its Frozen) and then one with all Disney characters which is just amazing. Get there 10-15 minutes early to secure a good viewing spot. Stay for the light show – the theme changes seasonally but the show comes as the the park closes and never disappoints. 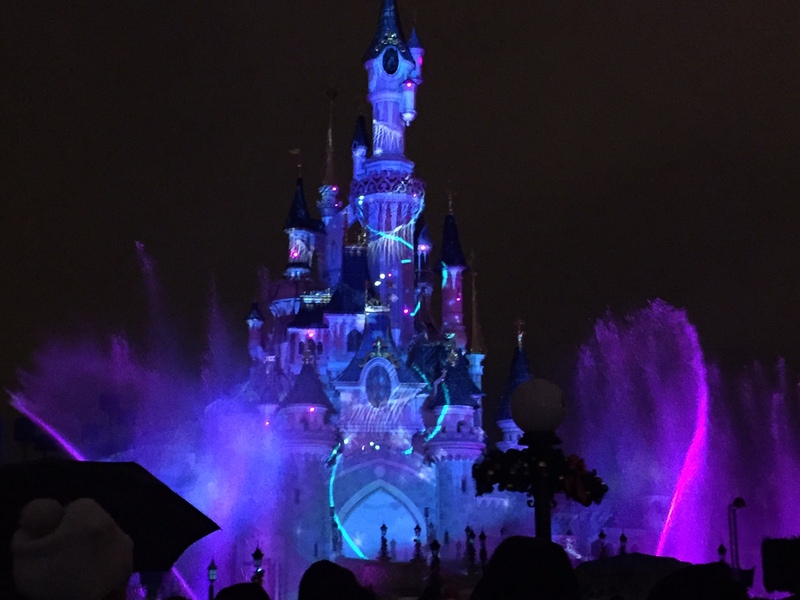 You will be treated to characters projected onto the Castle with fountain display, lasers and stunning fireworks. Wi-fi is not available in the parks, only in the Disney village and in the lobby of the Disneyland Hotel so you may have to hold off on the Instagram update until you’re back in your hotel room. Nearly everything is either in English or both English and French but some older rides including Snow White are in French, this is France after all. All staff speak English however and menus are translated. Bring plenty of money. Most hotels include Breakfast but you can expect to pay out around €50 a day for lunch and dinner (not forgetting you may want souvenirs). You’ll be hard pushed to find a salad but you won’t have to live on burgers. Enjoy yourself! Disney is for everyone – you are never too old for Disney!